As always you do not have to be a member of BMWCCA to attend ChapterFest. Also you do not have to drive a BMW to attend. I realize this is not a BMW forum, but we want other enthusiasts to know this is an open event. We have alot of enthusiast attend that are not BMWCCA members or drive a BMW. If you are an enthusiast, no matter the marque come out and have a great time. Well folks, it’s that time of year again. ChapterFest is just around the corner and it is shaping up to be our best event thus far. This year, ChapterFest has been moved back to Bowie Baysox Stadium and will take place on Saturday, October 30th. Please visit ChapterFest | Home for detailed information on each of the events and instructions on how you can register to participate. The issue we had last year with space due to the trailers parked on the lot will not be an issue this year. We will have use of the entire lot area and have parking for over 1000+ cars. Please feel free to post questions you may have. Also, we will have 6-8 people working the gate at peak times to help move things along. We are strongly encouraging everyone to pre-register, this includes general admission. With the number of people we are expecting, pre-registration will help expedite the check-in line. Pre-registered Autox participants will share a dedicated check-in lane with Street Survival. When you visit the ChapterFest site, click “ChapterFest Registration” to register for general admission or any additional events. I know some people hate registering for events, but this is the easiest way for us to manage a crowd this large for this type of event. 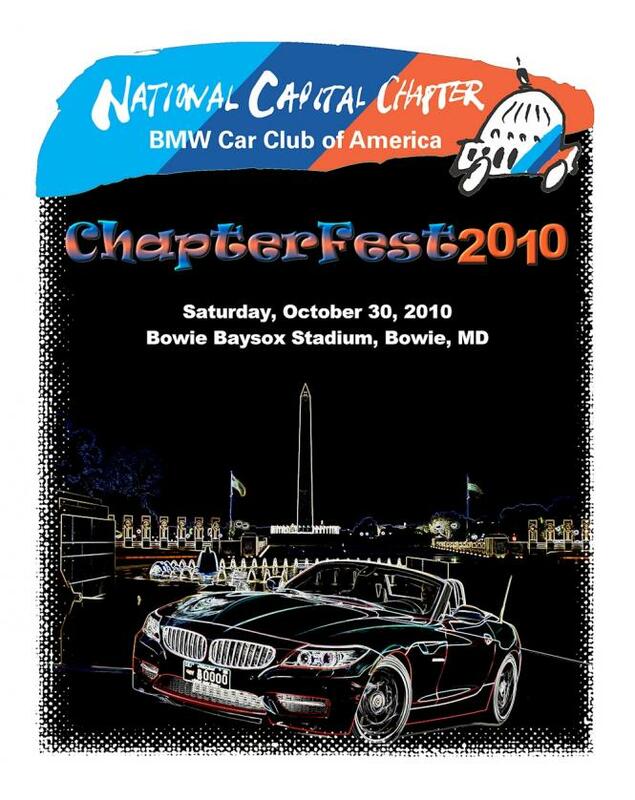 ChapterFest is the BMWCCA National Capital Chapter’s premier celebration for all car enthusiasts. In 2008, more than 250 people attended and in 2009, attendance doubled to more than 500. Both years attracted BMW CCA members and non-members from all over the east coast, with folks coming from as far north as New Jersey and as far south as North Carolina. This year, we hope to welcome more than 1,000 BMWCCA members and enthusiasts! ChapterFest 2010 will encompass everything we do as a chapter. We will, of course, have Autocross. BUT WAIT…THERE’S MORE!! The roads’ newest and youngest drivers will participate in our nationally recognized Tire Rack Street Survival School for teenage drivers. If you have a new driver or are a new driver, this is the event for you. Thanks to the involvement of US Karting, our karting league will have a karting course to feed your inner speed demon. A Concours d’ Elegance will display some of the cleanest cars you’ll ever see. If you want to understand how the pros detail their cars, maybe the detailing tech sessions will be for you. In addition, thanks to BendPak donating the use of four 4-post lifts, the DIY and Ladies’ DIY committees will each run DIYs and tech sessions throughout the day. After ChapterFest, BendPak is selling the 4-post car lifts at a discounted price. See the ChapterFest site for more info. If you are interested in purchasing the lifts, contact [email protected]. Dinan is signed on to run tech sessions. There will be items raffled off from companies such as Borla, Michelin, Slime, Griots and more. Lastly, in response to our female attendees, we will have dedicated men and women bathroom facilities with flushable toilets and sinks for hand washing. We will also have handicap accessible facilities. Currently, we are looking at options for a kids’ area. Check the ChapterFest site periodically for updated information. Mark October 30th on your calendar now! ChapterFest 2010 will not disappoint. There will definitely be more to do and see. So far we have 230 people registered. The pre-reg line will move alot faster than the non-reg line. Pre-reg not required, but strongly encouraged. If you have not signed up for ChapterFest please do so. Tomorrow is the last day to guarantee a t-shirt. I have to send the order to the vendor on the 20th. You can still reg after tomorrow, but we will not guarantee a t-shirt. I have attached a sample of what the design will look like. The white edges will not be there. It will be a frameless design on a black t-shirt. Also the more people that pre-register will allow us to give the caterer a close to accurate head count. Last year we had under 200 people sign up and ended up with over 550+ people coming out. That large of a gap makes it hard to ensure we order plenty of food. So far I have received items from Michelin, BavAuto, Turner Motorsport, Autogeek and Meguiar's. Still waiting on more.